Carlson Design attends the 2012 Marine Canvas and Awnings trade show hosted by the North Eastern Canvas Products Association in Springfield Massachusetts. 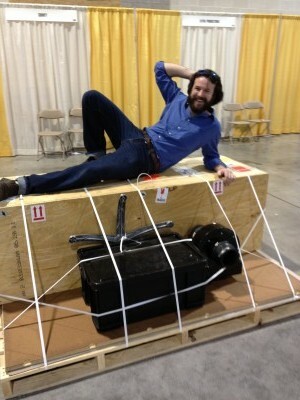 Plotter arrives in Style -- Get off there Sam! 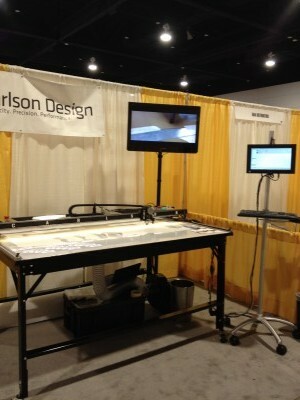 Carlson Booth -- All the bells-and-whistles! We had a great market day and enjoyed meeting everyone from the East Coast that stopped by our booth. Special thanks to Settler for throwing a great party Hawaiian themed beach party Friday night! If you missed us at NECPA, you can catch us next at the SWIFA – Southwest Industrial Fabrics Association — in Austin Texas on April 26th-28th!